Welcome to the shrine of the Werebeast, dwelling of the Great Spirit. Werebeasts are considered the most physical of all of the necromantic forms, having the ability to gorge themselves on the remains of any being, thus gaining both physical and mental healing from the process. Werebeasts are also known across the realms for their knowledge and aptness with armour. As Werebeasts attain higher and higher circles, they become better able to discern the strengths and weaknesses of their armour and can imbue them with magical strengthening. Upon reaching 30th circle, Werebeasts also learn the ultimate uses of their form. They learn to manipulate their body to change from a mere human into a raging beast, using the power of "Alter." Also at circle 30, Werebeasts gain the ability to release the full extent of their pent-up animal lusts in a violent fury of power, giving them increased attack and healing powers. 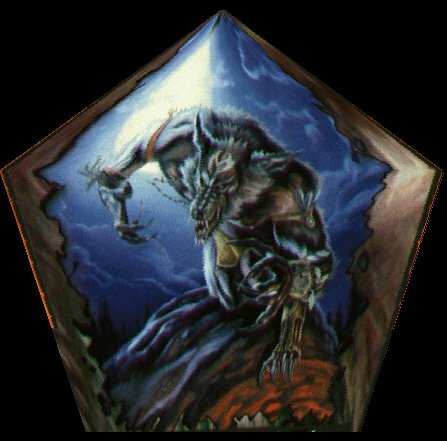 While excelling in physical combat, the Werebeast lacks the magical variety and power that characterize many of the necromantic forms. Members of this form must rely on the inherent power of their animal lusts to conquer in battle.